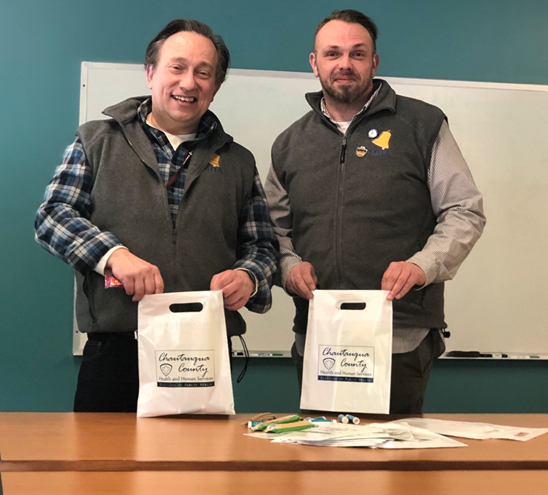 Pictured: Steven Cobb, Executive Director, and Sean Jones, Recovery Coach for the Mental Health Association preparing recovery bags to be distributed to community members who have experienced an overdose. MAYVILLE – There’s a new effort underway in Chautauqua County to respond to non-fatal overdose events with support and resources for recovery. 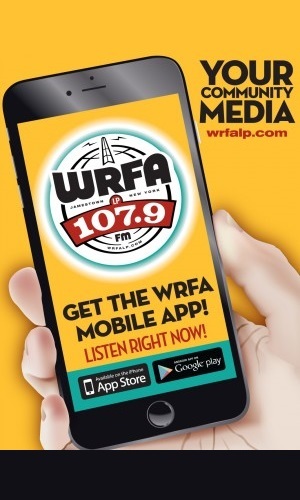 A true collaborative effort has led to the development of a program which will connect people who have experienced an overdose with a peer from the Mental Health Association within 48 hours. The project began in Jamestown this week. If the program is successful, County officials hope to expand efforts to all of Chautauqua County. The ODMAP Peer Response project mirrors similar work being done in Erie County by the Cheektowaga Police Department and the Erie County Department of Health.In December of 2018, Chautauqua County Executive George Borrello’s Countywide Alliance for Enforcement and Rehabilitation (CAER) issued a report recommending a number of measures be implemented to better address the county’s drug crisis. One of those recommendations called for the creation of a peer response program in Chautauqua County which has now come to fruition.